SalesHood, the leading sales enablement platform, today announced the release of its Prescriptive, Just-In-Time Content Management System to help companies boost revenue results and sales productivity. SalesHood powers the entire lifecycle of sales enablement from training and onboarding to coaching and content to performance tracking. SalesHood’s prescriptive just-in-time content accompanies five new product enhancements to the SalesHood platform including Content Library, Sales Process Coach, Smart Search, Automated Tagging, and Content Analytics. With SalesHood, sales and marketing teams work better together. Marketing publishes just-in-time content to salespeople knowing it will be viewed, used, and measured. Salespeople close more deals, faster by going to one place for learning, coaching, and content. "With SalesHood, our teams now only need one solution to access tools, training, and content to do their jobs, wherever they are,” John Hsieh, Vice President, Sales Enablement, DocuSign. Content Library: Publish fully branded and customized content for sales teams in Folders and Subfolders making it easy and instructional for sales teams to find what they need. 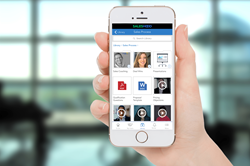 Teams access files, documents, win stories, sales tools, and pitch videos just-in-time from their mobile and web. Sales Process Coach: Access prescriptive, just-in-time content in context of deals to improve win rates and reduce sales cycle time. Content is tagged by sales stage, industry, product, segment, and custom attributes. The application is also available in Salesforce. Smart Search: Salespeople search for content using Natural Language Processing, spending more time selling with less time searching. Automated Tagging: Files, Documents, Folders, and, Videos are tagged, auto-tagged, and mass tagged to more efficiently prescribe proven best practices and just-in-time content. Content Analytics: Measure the effectiveness of content by getting visibility to views, downloads, likes, ratings, and feedback. Content is also mapped to deals to track the ROI of content. SalesHood helps companies accelerate sales productivity by improving knowledge, sharing content, tracking effectiveness and reinforcing best practices. We simplify and automate sales productivity using short videos, mobile, bite-sized content and social learning. We make it fun and efficient for teams to become more productive. SalesHood has more than 100 customers doubling win rates, increasing deal sizes, improving time to ramp, improving time to close and reducing churn. Join SalesHood today. For more information about SalesHood and a free trial, visit us at http://www.saleshood.com.